Will Immigration Be the Central Issue in Canadian Federal Election-2019? 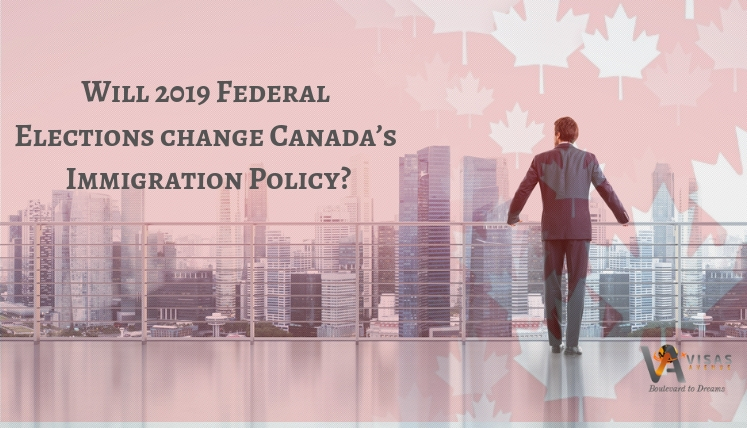 Just a few months have left for 2019 federal Elections to happen in Canada and hence, the buzz is already in the air regarding Immigration being the central issue in the elections this year. For that matter, immigration has already been the core issue in most of the federal elections in Canada in the last few years. And this year, it is even more prominent in view of ongoing immigration scenario across the globe and Canada’s pro-immigration stance in the last few years. Every Canadian is eagerly waiting for Canada Federal election date-21st October 2019 (Monday), when the public of Canada will vote to choose their federal government and make their voice count with regards to the leadership they want in the country. Three major political parties are more likely to run a campaign for the throne this time around, i.e. Liberal Party (the ruling party) of Canada, the Conservative Party of Canada and the social democratic New Democratic Party (NDP). Will 2019 Federal Elections change Canada’s Immigration Policy? The ruling Liberal party is known for its pro-immigration stance and they have proved it time and again. Few month’s backs when the US announced its policy to deny certain immigrants based on their citizenship and identity, Canadian Prime Minister very next day announced to welcome and accept the new immigrants in the country irrespective of their race, religion or identity, etc. The government plans to welcome more than 1 million permanent residents by 2021 as per Canada’s Multiyear Immigration Plan (2018-2021). Moreover, relaxing the immigration program requirements, airlifting the Syrian refugees, making the family reunification smooth and easy, are few of the steps, which established Canada as the pro-immigration political party. Hence, if the liberal party wins the elections this year, Canada will continue to be lenient on immigrants under them. Can Liberal party defend its throne in 2019 Election? Well, the big time question here is which party has the fire and ammunition to displace the Liberals, who are still looking strong despite few waves of criticism for Prime Minister Trudeau and his party in tenure of last four years. Canada ranks among top 3 best countries in the world for immigrants and residents based on Quality of life, Citizenship, and Education and for this, the federal government deserves the due credit. If we look at the past elections and political history of Canada, it is the economic slump that has cost the throne to the ruling party. And under PM Trudeau the economy of Canada has been strong and stable in last few years. The other key factor is the emergence of a strong opposition party or leader. The conservative party has been the biggest rival of liberals in the past, however, Andrew Scheer, who has replaced Steven Harper as the leader of the Conservative party, not looking very strong or popular leader in comparison of Justin Trudeau. Also, the leader of the federal New Democratic Party (NDP), Mr.Jagmeet Singh has also not shown extraordinarily promising signs as such, in this context. The decisions and policies of present Prime Minister of Canada, have been decent by and large. Will immigration be a telling factor in next elections? If immigration is the core issue in the elections this year, the Liberal party under Justin Trudeau will be in limelight for sure. Canadians support immigration to Canada from overseas, as they understand its importance for the country, which is struggling with issues like low population growth and skill shortage for the last few years. Though, there have been some concerns raised by the opposition with regards to the safety and security of Canadian borders and burden on the economy due to the refugees and asylum seekers. However, if we see a larger picture, it seems that the stance of the government has acceptance among people of Canada. In case, you wish to apply for permanent residency in Canada in 2019, you may get in touch with qualified and vastly experienced Canada migration expert at Visas Avenue- the top and trusted Immigration and Visa Consultancy Company specialized in Canada and Australia permanent residency process. The VA Team has an exceptional success rate in terms of helping the applicants get the approval of PR visa from the immigration office. You may call Visas Avenue migration experts on Toll-Free Number- 78-18-000-777. Moreover, to get your eligibility checked and subsequently, receive a call from the expert, you may fill the free assessment form.